Running is certainly a healthy activity, and a group of youngsters from Brooklyn has turned that passion into a form of sport. They may not always be the fastest team, but the runners from St. Joseph the Worker Catholic Academy, Park Slope, have plenty of heart. The academy formed a track program in the spring of 2013 for students in fifth through eighth grade. The program expanded to now include the Catholic Youth Organization (CYO) fall cross-country and winter indoor track seasons. 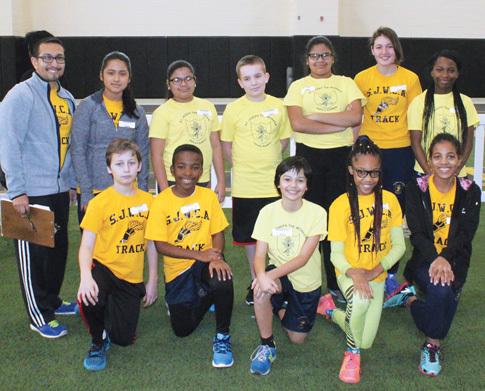 With a number of students involved in other activities at the school, the St. Joseph’s team, comprised of about 20 runners, is one of the smaller track programs within the Brooklyn Diocese. However, that has not stopped the team from working hard every day to be competitive and make their school proud. “There are no tryouts; I’ll take anybody who is willing to put in the effort,” said Barlow Mendez, the head track coach at the school. “Even though some of them are stretched thin, they do make an effort to be there for the practices and for the meets as well. The team meets once a week to work on conditioning, specific events and relay running techniques. Mendez tends to vary the practice schedule to keep the kids always having fun. “Some days we’ll work on core workouts, some days on our jumping… running long jumps and standing long jumps… and other days we’ll work on sprinting,” said Olivia Hamel, an eighth grader who has been with the team since it formed. Being a small group, the team has developed camaraderie that shows when it competes at the CYO meets. Even so, for such a small team, St. Joseph’s packs an impressive punch. “We’re small so people might look down upon us and think that we’re not going to do to well, but if we do well, they’re going to say, ‘They’re small, but they’re really tough,’” Olivia said. The St. Joseph’s boys’ team is the reigning division champion of last year’s indoor winter season. Though the team lost some key members, a new crop of student-athletes is eager to fill their shoes. More so than winning, the values these runners learn in the program aid in their development as athletes. Mendez is sure to stress the importance of respect. “I hope they learn how to respect each other as teammates and pick each other up when they’re down and how to respect their competition,” he said. “I try to stress to them that this is fun and it’s challenging. Track is a sport that teaches runners to compete both as an individual and as part of a team. And the values these runners learn at St. Joseph the Worker will surely guide them as they traverse the journey of life… one step at a time.